Cassiopeia A (Cas A) is a prime example of beauty paired with absolute destruction. We call Cassiopeia a supernova remnant in astronomy. It’s located 11,000 light-years away from Earth in our very own Milky Way. However, that isn’t the most fascinating part about Cassiopeia A.
What’s amazing is you’re looking at exactly the process of what breaths life into new stars and planets. It’s the threads of life that keeps the universe interesting and giving it a way of knowing itself. The colors that you see in the photo above are not for show. Each color represents an element. In fact, when you look at what common things are made from like the iron that’s in a cast iron pan or the silicon that is used to make glass. Those elements weren’t always on Earth. 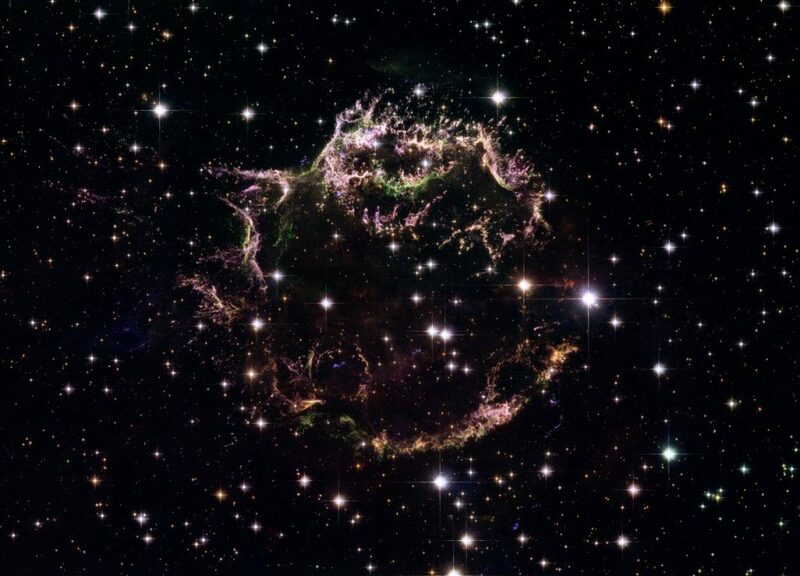 They came from supernova remnants like Cassiopeia A that disperse them at unfathomable speeds. The speed at which Cas A expels elements like sulfur (yellow), calcium (green), iron (purple), and silicon (red) is 4,000 – 6,000 km/s! That is like traveling across the entire U.S in under a second. Scientists calculated that the first light from this supernova reached Earth about 300 years ago. 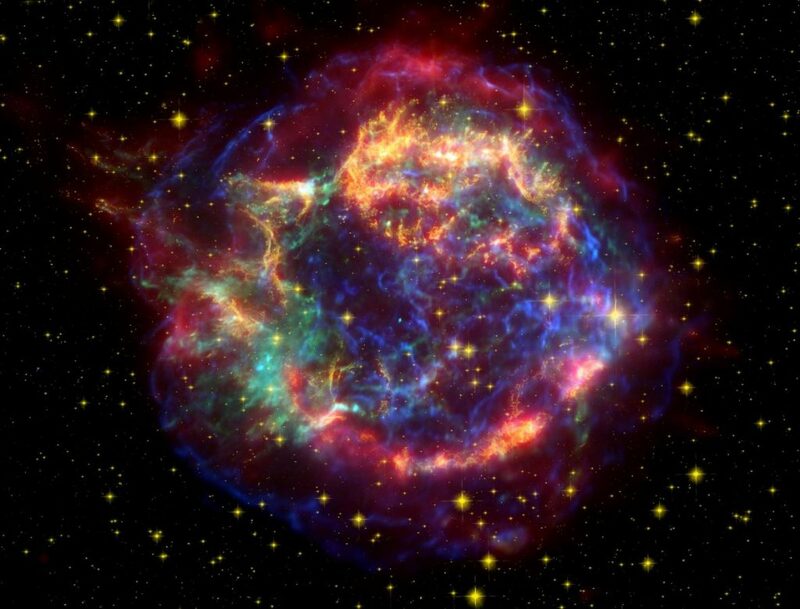 Since it’s explosion Cassiopeia A has ejected enough oxygen to fill one million Earth masses! Or three Sun’s! It’s also dispersed 10,000 Earth masses worth of sulfur and 20,000 Earth masses of silicon. Scientists thought when a supernova event happens that all gas gets ejected uniformly at the same speed. Instead, they found that matter gets ejected at speeds ranging 5,500 km/s to a whopping 14,500 km/s. The temperatures alone are estimated to be 50 million degrees F or 30 megakelvins. So why is it important to study beautiful remnants like Cassiopeia A? Well for one it showed us that heavy elements come from explosions like this one. It also taught us that life starts with an event that is terrifying and immense but expands and cools down into something gorgeous. We still have a lot to uncover and understand about supernova remnants and stellar evolution. At the very least we have something beautiful to look at in the night sky.